The birth of the Protestant Reformation is attributed to Martin Luther nailing his Ninety-five Theses on the door of the Wittenberg Church (Germany) on October 31, 1517. All across the region, this 500th anniversary has been remembered, and the evangelical churches in Egypt began planning months ago to have a special event of their own, encouraging each church group to seek international guests to join the celebration. The Church of God in Egypt was delighted to have Global Strategy regional coordinator Patrick Nachtigall, U.S.-Canada general director Jim Lyon, and Pastor Marcus Archer of Crosspoint Church (Natchez, Mississippi) accept their invitation to join the celebration, November 17–19, in Cairo. The event included one service of theological presentations, and a second with a world-class orchestral and choral celebration of reformation music through the centuries. Along with Ken, the three guests were invited to meet Coptic Pope Tawadros II at the Coptic Church headquarters in Cairo. Pastor Marcus even got unique photographic evidence of the opportunity! Then, the group went to meet one of the leading Islamic leaders, Professor Muhammad Mukhtar Gommaa, Egypt’s Minister of Islamic Affairs. Both meetings were marked by sincere hospitality and pledges of working in partnership with all Christians toward greater peace and tolerance in Egypt and globally. Jim Lyon was among a select group who also met privately with Egypt’s President Al-Sisi on Sunday morning. The pastors of the Church of God in Egypt met with their guests at our residence on Sunday. Ten of the current eleven pastors gathered to hear from Patrick Nachtigall, who praised the group for being an example of health, leadership, and unity for the region. The group of pastors also took time to each share about their church’s vision and challenges in each of their communities. In the evening, Jim Lyon shared a message of vision for the pastors at the Church of God in Shobra (Cairo) during that congregation’s weekly worship service. This was a special weekend and we are especially thankful for the time and support shown to the Church of God in Egypt by our three special guests. 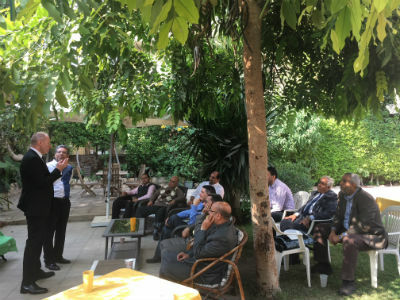 This demonstration of international connection could lead to greater opportunities for future church planting in newly zoned communities throughout Egypt. 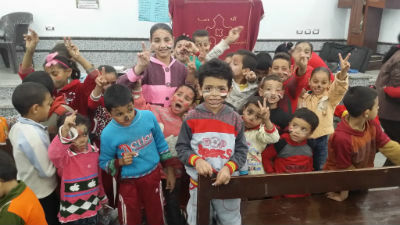 Sunday school class in Egypt. Many have been following the story of the rebuilding of the little village congregation in southern Egypt, through the united giving of the congregations in Egypt, as well as through gifts from the Church of God in the United Kingdom and North America. The new building is nearly complete, and will likely be finished soon thanks to a generous gift by our Living Link partner Blue Mountain Community Church in Walla Walla, Washington. BMCC’s gift is being made in memory of Ernest LaFont, whose family is among the excellent legacy of service to the Church of God in Egypt. Though not finished, the church is growing in the parts that have been completed (see picture of one Sunday School class). We hope to have a dedication service in February. It’s a joy to share that a second southern Egypt congregation has surprisingly received permission to rebuild! The Church of God in Minya is the third oldest of the buildings in Egypt, and renewed facilities will help to meet the needs of their growing ministries. Spread the Word (STW), a ministry supported through the offerings of the International Youth Convention, recently gave a matching gift to the Church of God in Minya so they could purchase a minibus. This has helped the church transport families to and from church events in a community without adequate public transportation and where many families do not own a car. Ken and Keli Oldham are Global Strategy representatives to the Middle East. Learn more about Global Strategy, and take advantage of opportunities to support the international reach of the Church of God, at www.chogglobal.org. This entry was posted in All Church of God, Global Strategy, Youth Ministries and tagged Blue Mountain Community Church, Cairo, church expansion, church growth, Coptic, Crosspoint Church, Egypt, Ernest LaFont, Europe and the Middle East, Europe-Middle East, Global Strategy, government, international, International Youth Convention, IYC, Jim Lyon, leaders, Luther, Marcus Archer, meetings, missions, Mississippi, MS, Natchez, offerings, pastors, Patrick Nachtigall, Protestant Reformation, rebuilding, Spread the Word, STW, testimony, transportation, travel, WA, Walla Walla, Washington, youth. Bookmark the permalink.